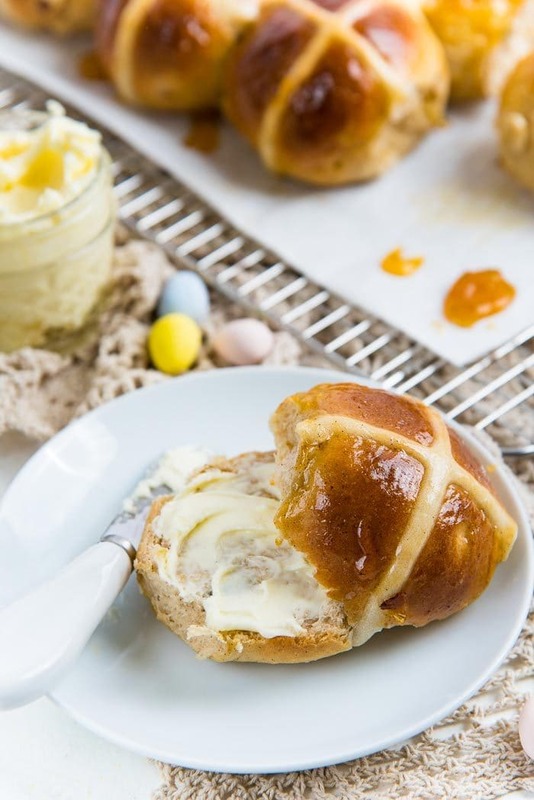 Soft, fluffy, delicious Spiced Hot Cross Buns, with a sweet, fruity apricot honey glaze! Made even softer and fluffier with a simple technique. Back when I used to live in Australia and New Zealand, we’d get hot cross buns of all kinds of flavor popping up in bakeries everywhere, for months leading up to Easter. There used be a bakery below my clinic in Lismore, Austrlia, and they made some of the softest and incredibly delicious hot cross buns, and it made our whole building smell like sugar, spice and bread for days! Even better, they knew us, and would dole out free buns every now and then. They might as well have included that in the benefits package of my job. So growing up in that part of the world, soft, fluffy, tasty hot cross buns were a staple around Easter, and I never had a reason to make my own. But that supply ran out when I moved to the US, and I started making my own several years ago. These Classic Spiced Hot Cross Buns are so easy to make, soft, fluffy and also really quite addictive. The recipe is simple, but for best results, you do need a little bit of patience to let them proof well. It’ll be absolutely worth your while though! My recipe for hot cross buns includes a little twist to make them even softer and fluffier than traditional recipes. And that little secret is tangzhong. Tangzhong is a Japanese cooking technique used in making milk bread. I use tangzhong to make these classic Sri Lankan raisin buns that are a tea time tradition in Sri Lanka. 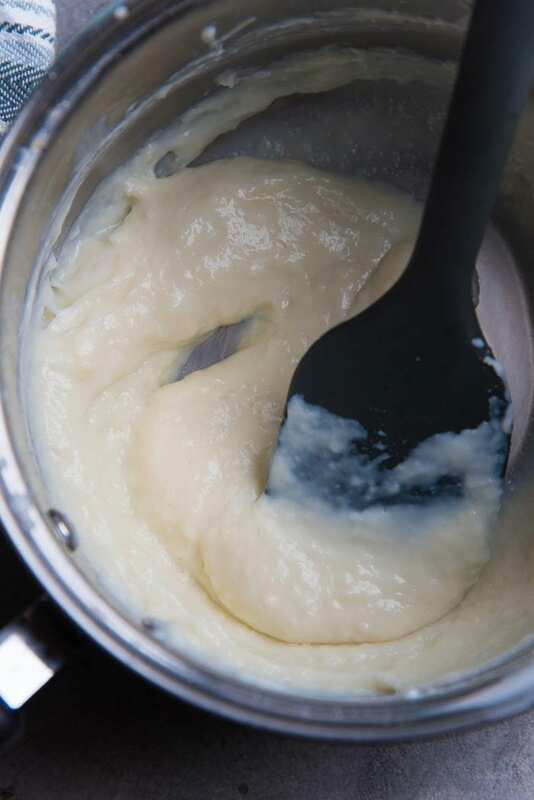 Tangzhong is a slurry of cooked water (or milk) with flour. 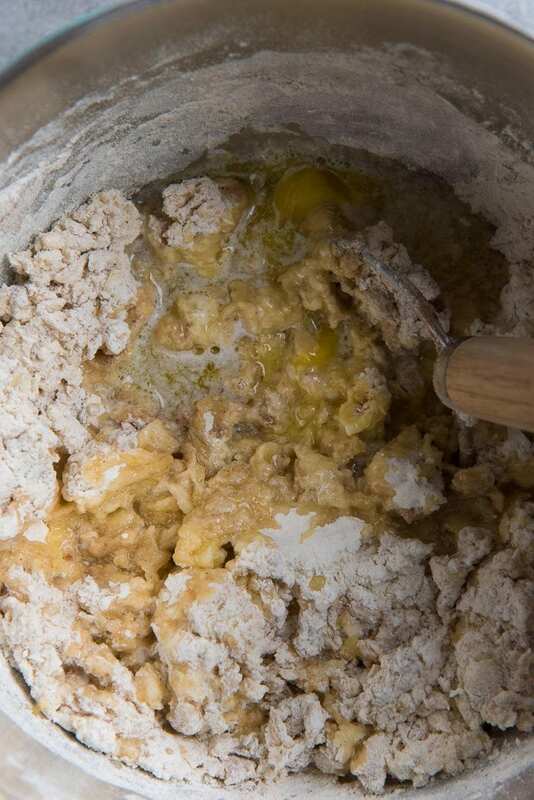 A small amount of flour and liquid are cooked on a stove to make a runny paste. It doesn’t take more than 5 minutes. As the liquid heats up, the flour absorbs the hot liquid, creating expanded starch molecules and gluten structures. This is then mixed with the rest of the ingredients. It’s a really simple technique to elevate the flavor and texture of bread, with delightfully soft, fluffy results. I won’t get into the science of tangzhong in this post, but for all the science nerds (like me) out there, I’ll explain how tangzhong helps easily transform bread recipes in another post in the future. The base for these classic hot cross buns is my homemade hot dog buns, another really popular recipe on my blog. It’s no secret that I prefer to weigh dry ingredients with a kitchen scale, rather than relying on measuring cups. A basic, inexpensive kitchen scale guarantees consistent, accurate results. For liquids, I mostly use volume (and occasionally weight) measurements. 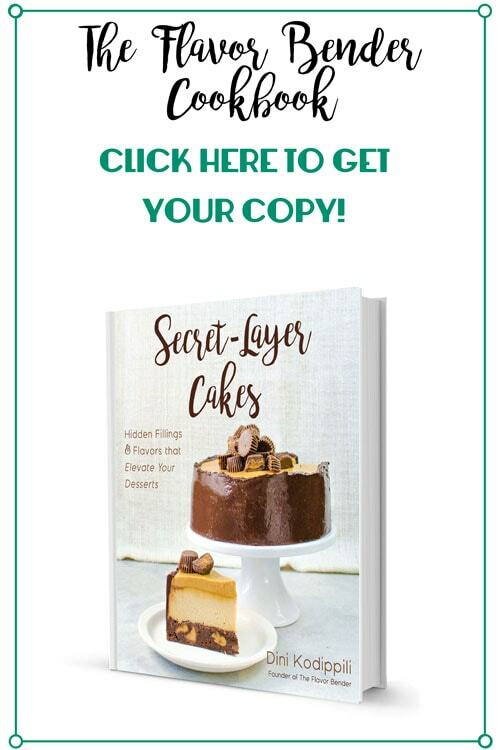 If you don’t have a kitchen scale at hand, you can use cup measurements, but make sure to use the spoon and level method to measure the dry ingredients. This is the second step. I use dry active yeast, and I usually don’t have to activate it if I had stored it in the freezer, and it was relatively fresh (less than 2-3 months). But if it’s older than that, or wasn’t stored properly, then I would recommend activating the yeast BEFORE making the dough, in order to make sure your yeast is still active. The tangzhong paste is easy to make, and comes together quickly. You have to make sure that you whisk the paste constantly while cooking, to prevent any lumps from forming. 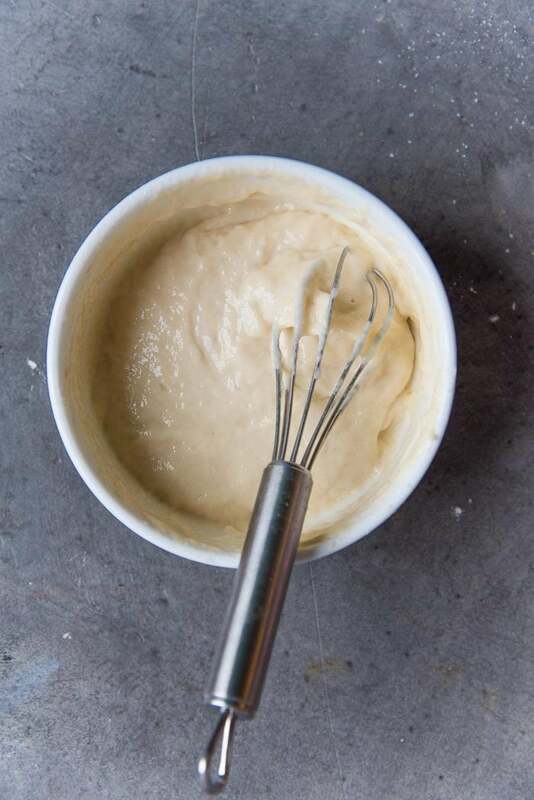 When yeast is activated and the tangzhong paste is ready, you can mix all the ingredients to make the dough, and knead it into a nice, smooth dough. When should I add the dried fruits to the dough? Some hot cross bun recipes call for raisins, mixed peel and other additions to all be added at the same time. But I prefer not to add those at the beginning. The smoother the dough, the better the gluten structure. And the better the gluten structure, the more air it can trap, resulting in soft, fluffy buns and bread rolls. By adding raisins and other additions to the dough at the beginning, you interrupt the gluten formation while kneading the dough. End result? Not as fluffy and pillowy soft buns. So I prefer to add these later. There are two different time points at which you can add these, and you can choose either. 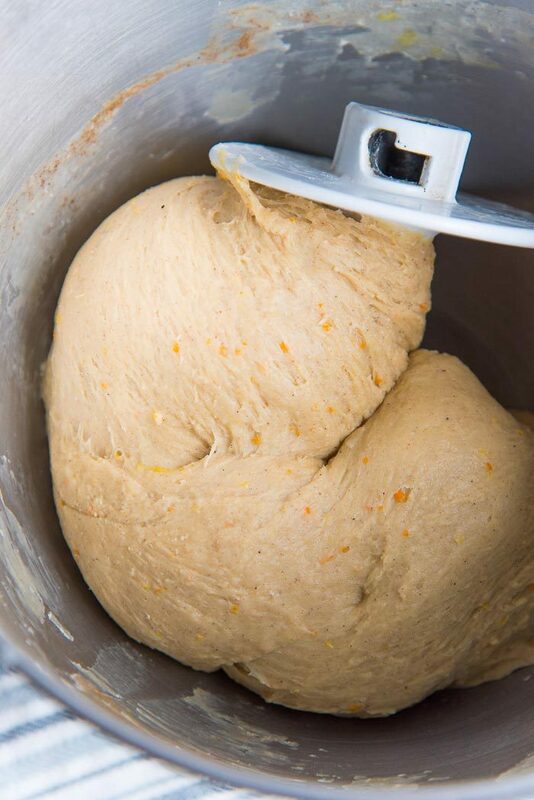 Add dried fruits after kneading the dough for a few minutes until you get a smooth dough. Then knead the dough further to incorporate the dried fruits and other additions. 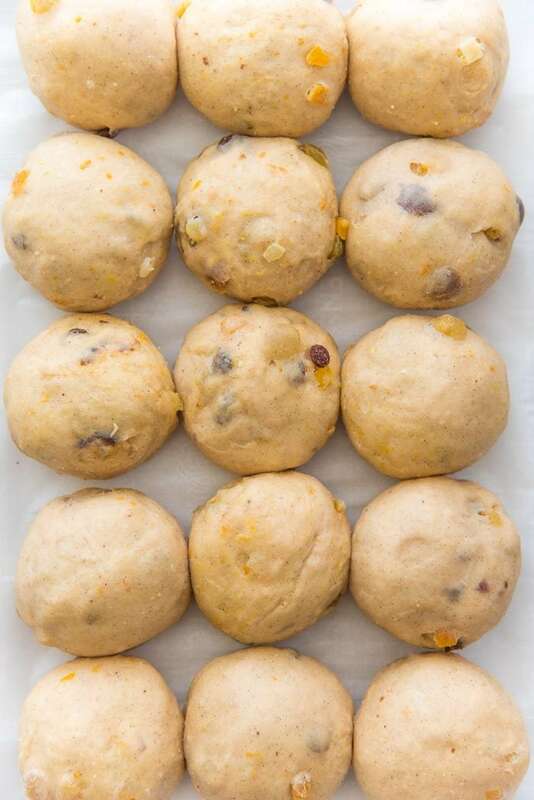 After the first proof of the dough, add the dried fruits and fold them in until they are uniformly mixed through. I personally prefer the 2nd method. It does take more time, but I get optimal results this way. This is because the second method allows for better gluten development, resulting in softer and fluffier spiced hot cross buns. What additions and dried fruits can I use in these spiced hot cross buns? I like to use A LOT of raisins, because I LOVE ’em, and I use a combination of golden and brown raisins, and you can use either one or both. I also love adding mixed peel. If you like nuts in your hot cross buns, then you can substitute some of the dried fruits for nuts too. Another trick I use is to soak the raisins in warm orange juice. This plumps up the raisins, making them juicy and adds a lovely orange flavor to the buns too. You can substitute the orange juice with wine or bourbon, or apple juice or any other fruit juice you like. Just make sure it’s warm so it’s easier for the raisins to soak it up. So once the dough is proofed, and the dried fruits and other additions have been mixed in, the dough is ready to be turned into buns! 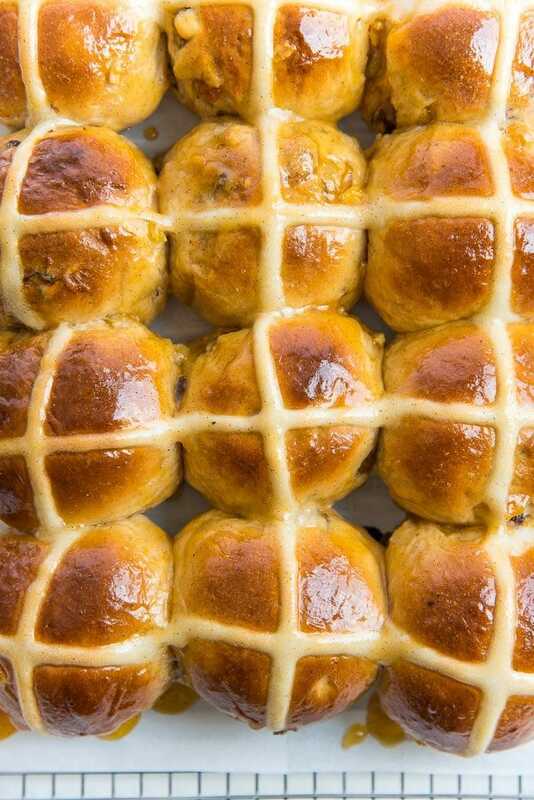 What’s the best way to portion out the dough into individual hot cross buns? You can weigh the dough, and then divide it by 15. Then you’ll know how big each portion needs to be. For this spiced hot cross bun recipe, each portion should weigh about 74 – 77 g each. By measuring each portion this way, you ensure evenly sized, beautiful classic hot cross buns. It’s important to shape the buns well, so that they keep their shape as they are rising. I like to knead the portion first, and form it into a ball by pinching it at the bottom (so you get a smooth surface on top). Then I roll this dough ball on a floured surface with a cupped hand to shape it. Then they are proofed one last time, before being baked. 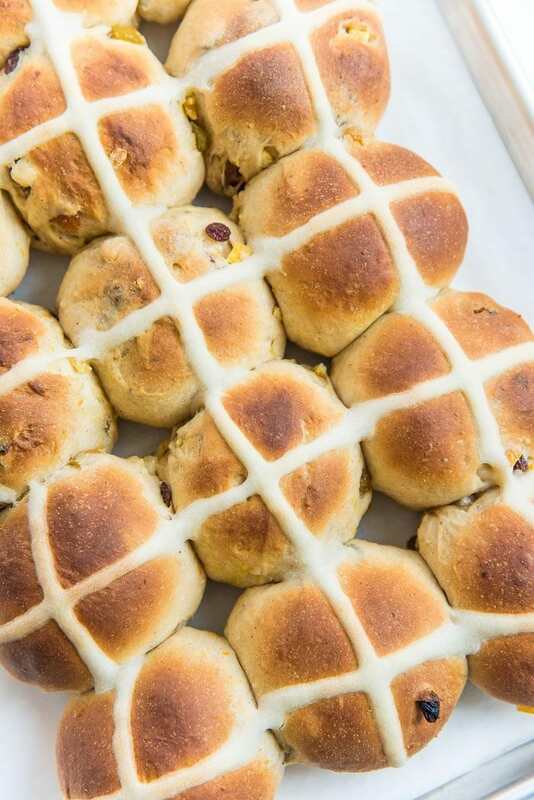 A feature of classic hot cross buns is the crosses on top. Without those, they are simply spiced bread buns/rolls. Some prefer to pipe frosting crosses on top, but I personally prefer the crosses to be baked into the buns. These crosses are made with a mixture of flour, confectioner’s sugar and water. You add enough water to form a paste, and then this is piped on top of the buns. Once baked, they become crispy, and add a lovely crunch as well. To glaze or not to glaze? 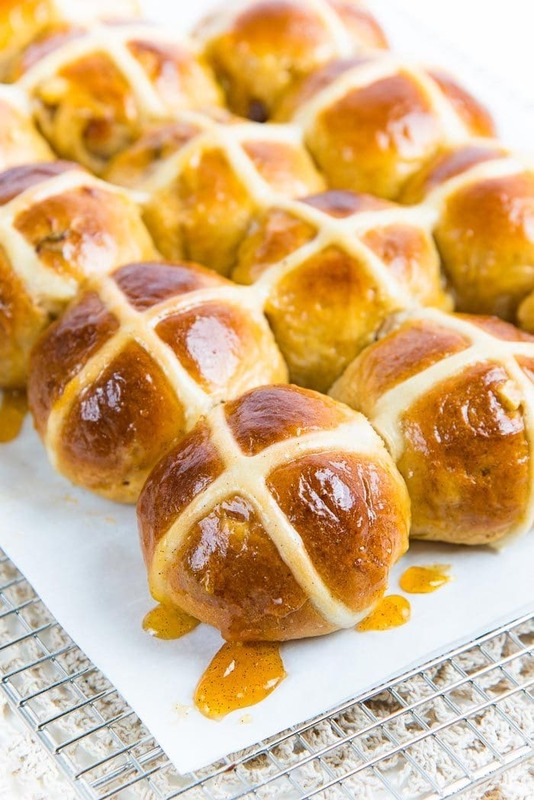 A sweet apricot and honey glaze AFTER the hot cross buns are baked? So there you have it. These spiced hot cross buns are addictive, I kid you not. And baking these sweet, spiced buns will make your whole house smell AMAZING! My favorite way to eat them is with a little salted butter, but we also like it toasted with some butter or jam. Hope you guys like ’em! If you liked this authentic Spiced Hot Cross Buns recipe, don’t forget to subscribe for new (and free) recipes by entering your email address in the subscription box below the recipe card (and get all these recipes delivered straight to your inbox), so you don’t miss out on a thing. 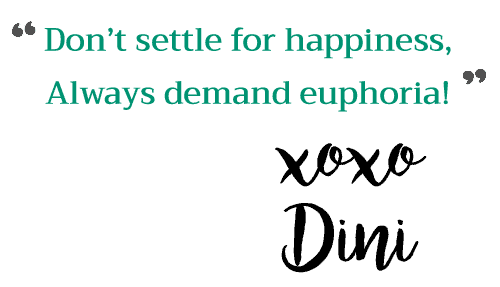 You can find me on FACEBOOK, TWITTER, INSTAGRAM, PINTEREST, YOU TUBE and GOOGLE-PLUS too. 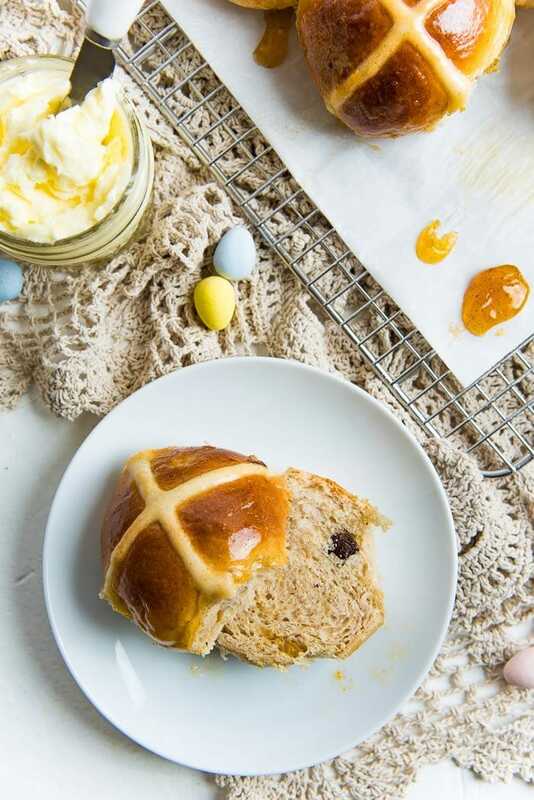 The best classic spiced hot cross buns recipe with step by step instructions. Soft, fluffy and incredibly delicious! Measure out all the ingredients for the dough. Separate the milk into two ½ cup portions. Place ½ cup of milk in a small saucepan, and the other ½ cup in the mixer bowl. Dissolve about ½ tbsb of the sugar in the warm milk in your mixer bowl. Sprinkle the yeast over the milk and stir gently. Let the yeast activate for about 10 - 15 minutes until it looks frothy and foamy. Take 3 tbsp (about 30 g) of the measured AP flour, and whisk it into the milk in the saucepan. Make sure the flour-milk mix is completely smooth, with no lumps. Heat the flour-milk mix over medium heat, while whisking constantly. In a few minutes the flour-milk mix will start to thicken. Keep mixing while whisking, until you have a runny paste. Remove from the heat. The tangzhong paste is now ready. Let the raisins sit in the warm orange for at least 30 minutes (this is to soften the raisins and for them to absorb some orange flavor). Drain and just lightly squeeze the raisins to make sure they are not soaked. If you'd like to, you can add bourbon or brandy or cognac to the orange juice as well. Place the flour and confectioner's sugar in a bowl and whisk together. Add water, 1 tbsp at a time, until you have a smooth paste that's runny enough to pipe easily, but will not run off the sides of the buns either. (For me, this is about 4 tbsp and a bit of water). 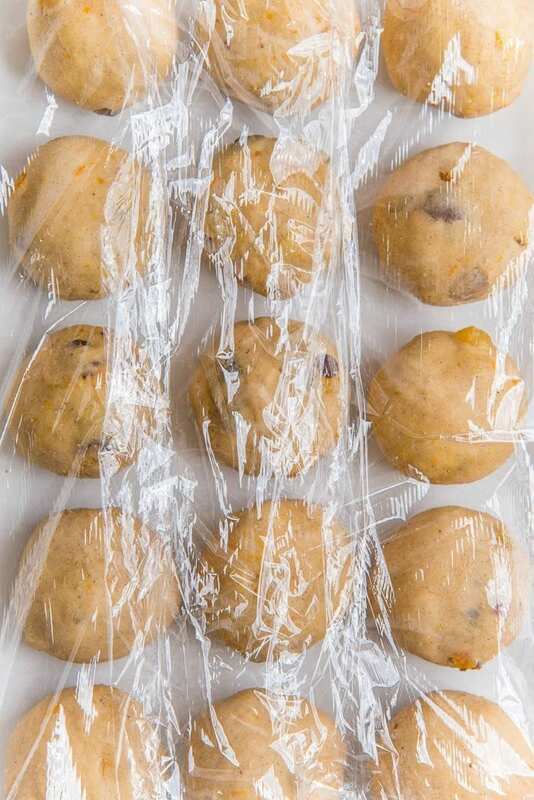 Place the flour paste in a small piping bag, or a ziploc bag and set aside. Place the jam, honey, and vanilla in a saucepan. Heat over low heat until the mixture is runny and liquid. To make the glaze even smoother, pass the jam mix through a fine sieve to remove any bigger chunks. Return the glaze to the saucepan and keep it warm until the hot cross buns are ready. See recipe notes for egg wash instructions. In to the mixing bowl with the activated yeast - add the remaining flour, sugar, egg, melted butter, spices, zest, salt and vanilla. Add the tangzhong to this as well. 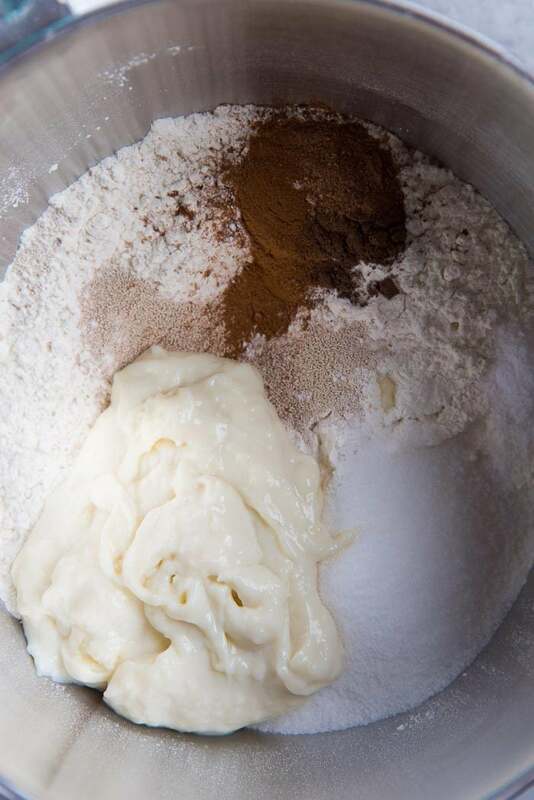 Mix all the ingredients together to form a scraggly dough. With the kneading hook attached to the stand mixer - knead the dough until you have a smooth dough (about 2 - 3 minutes). Check the consistency of the dough. It should be soft and a little tacky. If it’s too dry, add just the smallest amount of water (1 tsp at a time), or if it’s too sticky, add the smallest amount of flour (1 tsp at a time), until you get the right consistency. Knead the dough for a further 8 - 10 minutes. (See recipe notes about adding the raisins at this point). Place the ball of dough in an oiled bowl, covered with plastic wrap. Allow the dough to rise, until doubled in size (about 1 hour). 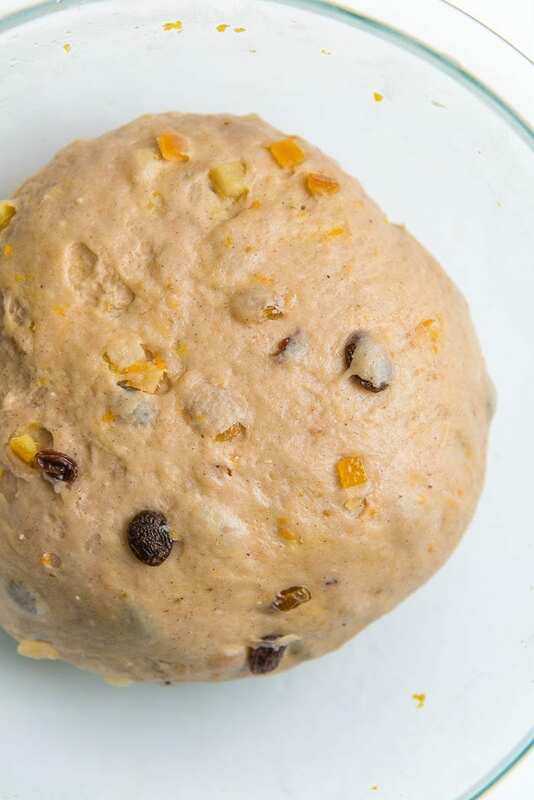 After the dough has proofed, add the prepared raisins, mixed peel and fold them into the dough until they are well distributed. 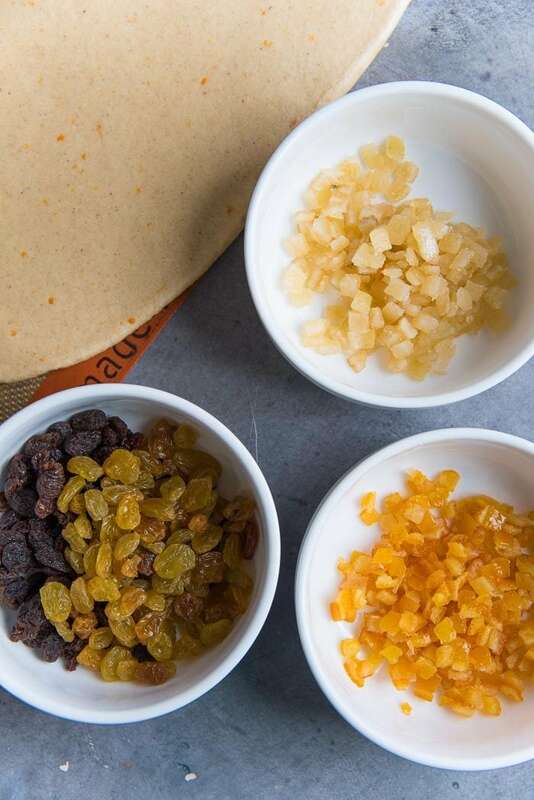 Another way to mix the additions into the dough is to flatten out the dough on a lightly dusted surface and to sprinkle the raisins and mixed peel over the dough. Then roll up the dough and knead it for a couple of minutes to mix it all in evenly. Place the dough in an oiled bowl covered with plastic wrap, and let it proof again. You can proof it for about 60 minutes in a warm place (until doubled in size), or for 12 - 24 hours in the fridge. When the dough has proofed for the second time, gently press on the dough to remove excess air. Divide the dough into 15 equal portions. (Weigh the dough and divide the weight by 15. This is how much each portion should weigh. This can be between 73 - 77 g). Line a half sheet baking sheet, or a jelly sheet pan with parchment paper. Take each dough portion, and knead it a couple of times. If the dough is sticky, lightly dust your hands to knead. Then pinch the edges at the bottom to form a ball of dough with a smooth, taut surface on top. Gently roll the ball of dough on your work surface with a cupped hand to shape the dough ball. 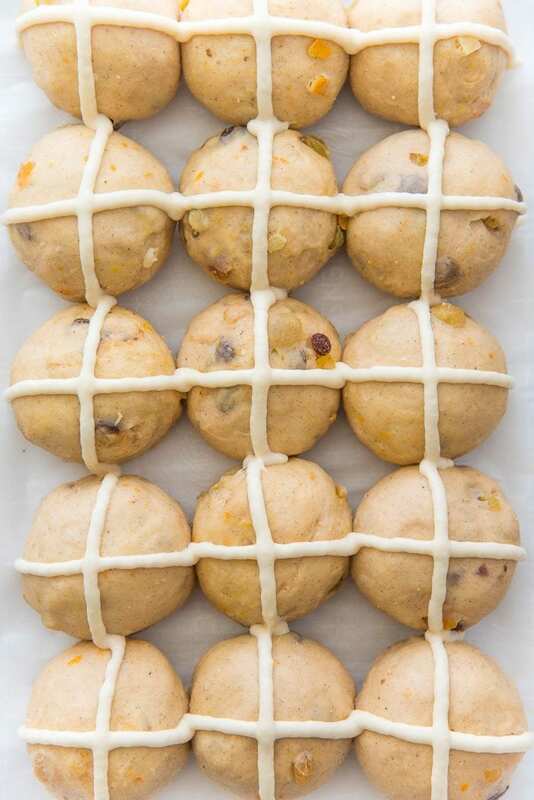 Place each of the prepared hot cross buns on the prepared baking pan, in a 3 x 5 configuration. Leave about 1 cm of space between the dough balls. Cover the hot cross buns, and let them proof for the final time. On a cold day, this takes me about 90 minutes, and on a hot day, it'll be about 45 minutes. The way I test for proofing is by gently pressing my finger tip into a couple of the buns. If the indentation springs back up, then it’s not ready. If the indentation remains, then they are sufficiently proofed and are ready to be baked. While the dough is proofing, prepare the flour paste for the crosses, and preheat the oven to 375°F. Snip off the edge of the piping bag (make sure the opening is smaller than the desired thickness of the lines that you want to pipe). Pipe the flour paste over the hot cross buns. Place the buns in the preheated oven and bake for 30 minutes. Rotate the tray if needed, halfway through baking. While baking, prepare the sticky glaze, and keep it warm. 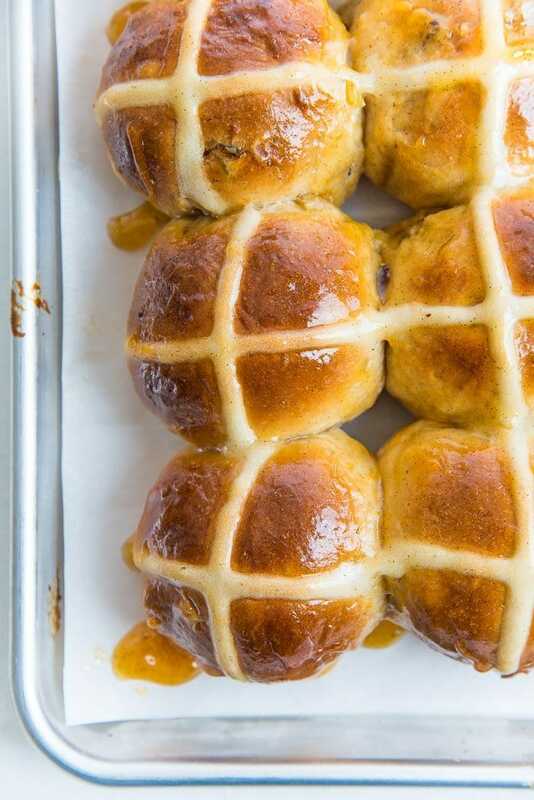 As soon as the buns are done baking (an instant read thermometer will register at 200°F or over when they are done baking), remove the baking tray from the oven, and let the hot cross buns cool for a few minutes. Brush the warm apricot glaze over the warm buns, and then let them cool completely. These are best eaten warm or lightly toasted with a little butter. Enjoy! Adding the raisins - To cut down on time, you can add the raisins and mixed peel after kneading the dough, and then knead or fold the dough to mix it all in at this stage. However, I prefer to follow the recipe as instructed for best results. 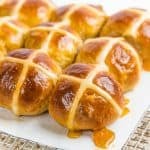 Egg wash option - Before piping flour crosses on the buns, glaze the buns with an egg wash. Then pipe the crosses on the hot cross buns, and bake according to the recipe. 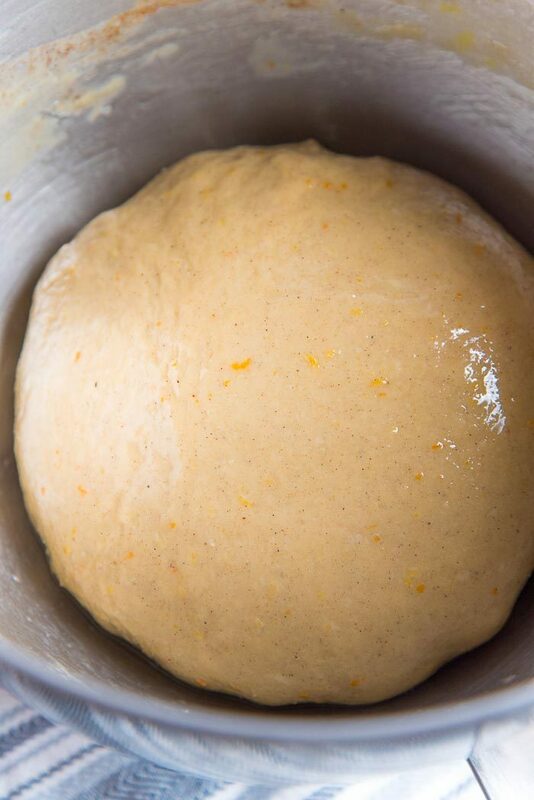 You will NOT need the apricot glaze if you use egg wash (but note that the egg wash will not add a sweet, fruity flavor like the honey apricot glaze). Egg wash recipe - 1 egg yolk + 2 tbsp cream, mixed together. WOW! This hot cross buns looks delicious!